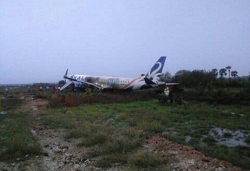 The aircraft failed to stop within runway lengh during landing in bad weather and overran about 200 meters. No injuries occured but the E-190 received heavy damage. 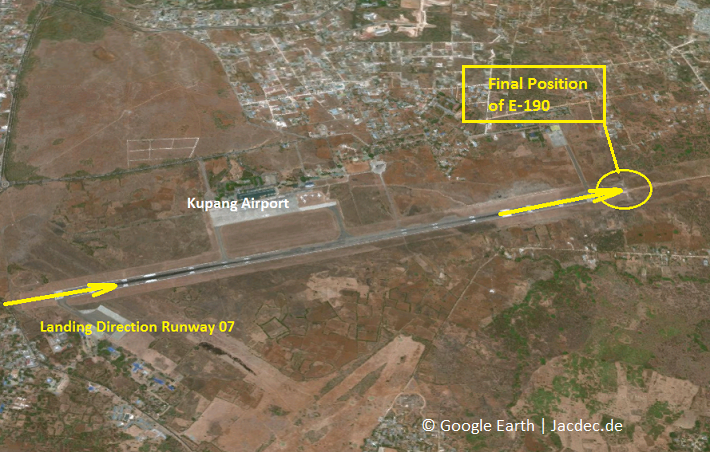 On landing in intense rainfall on runway 07 at Kupang Airport, Indonesia, the Embraer E-190 overran the end of runway 07 (lengh=2500 x 45 m). 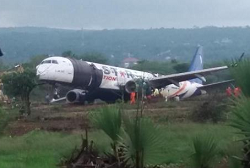 The aircraft ran across uneven terrain until it came to a stop about 200 further with its right maingear collapsed. 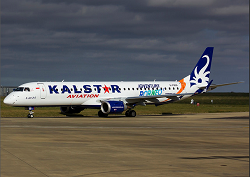 All on board evacuated safely via on-board chutes. There were no reports about any injuries. Indonesian authority NTSC has begun an investigation. 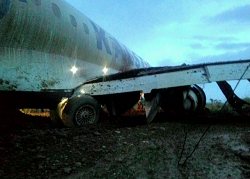 The days after the occurence, heavy equipment was brought to the aircraft to remove it back onto paved surface.